Texas court dismisses felony abuse of power charge against former Gov. Rick Perry. Former Texas Gov. 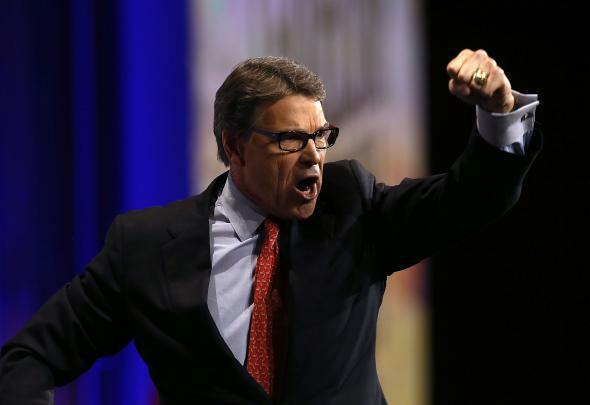 Rick Perry fired up, for a totally unrelated reason. A Texas state appeals court on Wednesday dismissed a 2014 felony abuse of power charge against former Texas Gov. Rick Perry that lingered in the court system for a year and a half and helped torpedo his 2016 presidential run that, in fairness, had a high probability of torpedoing itself. The Court of Criminal Appeals also upheld a lower court’s dismissal of another felony charge of coercing a public servant. A grand jury in Travis County indicted Mr. Perry in 2014, charging him with abusing his power while in office in 2013 when he pressured the district attorney in Austin to step down by threatening to cut off state financing to the anticorruption unit in her office. He became the first Texas governor in nearly 100 years to face criminal charges… The case centered on Mr. Perry’s veto power as governor and his political maneuvering after the drunken-driving arrest of Rosemary Lehmberg, the Travis County district attorney. After her arrest, Mr. Perry and his aides threatened to veto $7.5 million in state dollars for the public-corruption unit in her office unless she resigned. Mr. Perry followed through on his threat, vetoing the money by declaring that he could not support state financing “at a time when the person charged with ultimate responsibility of that unit has lost the public’s confidence…” The grand jury had charged Mr. Perry with coercing a public servant and abusing his official capacity, both felonies. “The intended recipient of the funds that Perry vetoed, the district attorney’s Public Integrity Unit, had been investigating one of Perry’s favorite projects,” according to NPR.